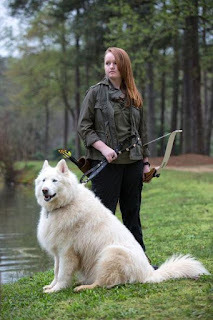 FROM GOODREADS: Two genetically altered dogs, two different fates. One is Robo, a beloved Great Dane, who is tricked out of the embrace of his human family and then is horribly altered by an evil scientist who rebuilds him with robotic parts, weaponizing the dog for money from the military. But that s not all the scientist does the experiments he conducts leave Robo a genius, almost immortal and with powers beyond explanation. But the horror Robo experiences at the scientist's hands changes him driving him insane with the sole mission to destroy all humans, especially those who have tortured and hurt dogs. Meanwhile, a scrappy alley husky sits in a shelter, when she with her blue eyes and tough wolf-like features captures the attention of another group of scientists desperate to stop Robo from his path of destruction. This dog, called Blue, could be the chosen one to fight and defeat Robo. She is also genetically enhanced and left with glowing turquoise eyes before being released to face Robo s vicious dog army. Her mission: save human civilization and the packs of dogs she's grown to love. MY THOUGHTS: I was quite happy to join the blog tour for Ross' first book, Blue's Prophecy because when I saw the cover, I'm pretty sure it was love at first sight. I'm also really impressed that the author is so young (13) and this is her first publication. While some areas of the book presented some problems for me, overall it was a quick, action-packed read and I can see quite a few middle-graders, young adults and even adults enjoying this one as well. 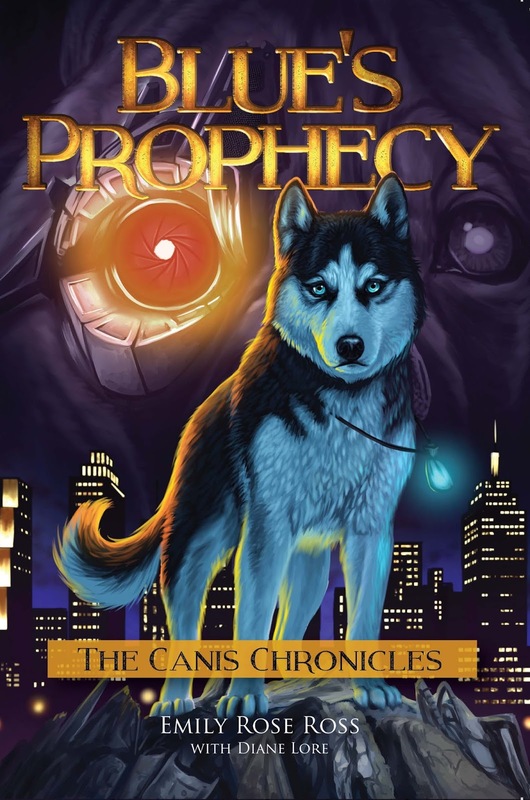 There are two main characters in the book, a Great Dane named Robo and a Husky mix named Blue. Robo used to have a loving family but because of a crazy scientific vet who wants to use dogs as military weapons, he is ripped away from his human family and made into some cyborg/dog hybrid. This triggers a lot of anger in Robo so he eventually escapes and become leader of movement made up of dogs who are out to end the human race. Robo is consumed by hate and considers no human worthy of being saved. Blue has been a stray all her life and has known very little love. However, she meets two young pups who she rescues from getting hit and slowly but surely, starts showing a softer side. In addition, Blue is also genetically enhanced but is just learning to use her powers. Blue becomes "The Chosen One" and starts a rebellion to stop Robo and his evil plan. I really liked the underlying message of this book. Pretty much it shows the canine/human bond and what happens when "bad" dog owners intervene. There are lots of different breeds throughout the book and the book is never dull. The reason why I didn't rate is higher than 3/5 is basically due to personal preference. I have a really hard time reading books with dog violence and death, even when it's done by other dogs. The book was written well and none of what occurred was in bad taste. However, it's just hard for me to stomach. In addition, there is a cliffhanger at the end and I sort of wished it had just been a stand alone novel. That being said, Ross should be proud of her accomplishment and I will definitely be keeping an eye open for any future works. I will also more than likely pick up any sequel because I have gotten attached to quite a few characters in the book and I really want to know what happens next. Emily Ross, 13, is a fifth generation writer and an owner of three dogs, Balta, Buddy and Zoey. Her prose exceeds her years, with Emily starting work on Blue's Prophecy, a science fiction/fantasy book for pre-teens and teens, when she was 10. Living in Atlanta, Emily is also an animator and a skilled archer, and relaxes by playing the double bass in her middle school orchestra. Thank you for your review. I really appreciate you taking the time to think deeply about this and to be honest. I hope you love the next books and and again, thanks for great feedback. Emily R.
Thanks for visiting Emily and for sharing your wonderful book! The cover is totally gorgeous! I'd buy it for that but I just can't read anything with violence against dogs! I find it too upsetting! Some of it was but I really did enjoy it other than that. Oh wow, to be so young and do such a good job. Third generation writer, I think she has had some good coaches...lol. :) This sounds like a really interesting book so I am going to put it on my wishlist. The cover alone drew me in, but I love the storyline. I am very impressed by the author too. I know. I can't wait to see what she does over time. She should be so proud. my kids love that breed SO MUCH! I think I will end up getting a puppy soon :) That cover! I want to read it just because of that cover! If we didn't have 2, we would be getting one as well as I think I'm catching puppy fever. Two is plenty though and I don't think Booker T or Cass would think too much about adding a third right now. I am in awe that this book was written but someone so young. That cover is amazing and I totally understand why you fell in love with it, Barb. Great review! I can't even imagine writing a book when I was 13 - I was way too caught up in angst probably! Great review and it does sound like a good read - although like you I struggle with violence against dogs in novels.